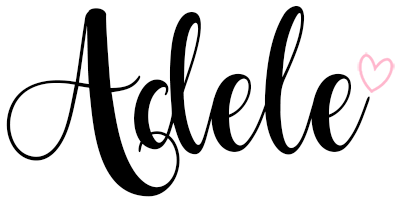 I am back today with something oh so very exciting. For me, September has always symbolised Back To School and almost like a mini fresh start, we're into the last part of the year and I still get sucked into all those Back To School deals, I am sure I am not the only one! But when you work opposite a stationery store that has purely those sort of deals on, it is so difficult to resist, am I right? 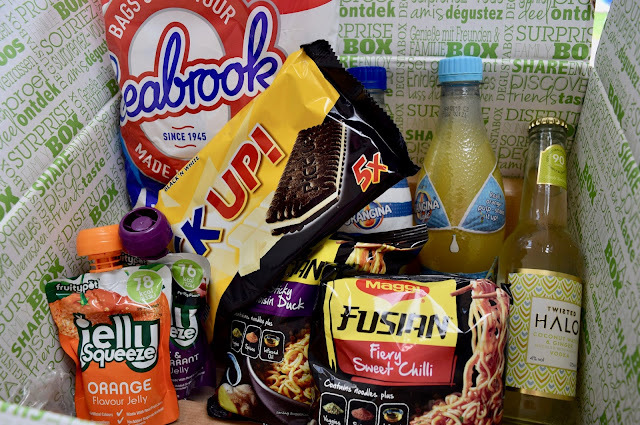 So on to my exciting news, I received the August Back To School Degustabox* this month, and oh boy are there some yummy treats. So much so, Phil and I are going to have a mini picnic with treat bags and everything, I actually cannot wait! As the theme was Back To School, there were plenty of treats aimed at this time of year. I have tried Seabrook crisps before, mainly for their more unusual flavours like Beef & Canadian ham, but when I found these in Degustabox this month, I realised I hadn't tried the most popular ones! This 6 pack contains two bags of the 3 most popular flavours: Sea Salted, Sea Salt & Vinegar and Cheese & Onion. Phil nabbed the Sea Salt & Vinegar ones right away, however he did let me try a few and they were so yummy! I'd have to say they were my favourite flavour out of the lot. These small bags are easy to pop in any lunchbox! What's your favourite flavour of crisps? Pick Up! Bars are not something I've tried before, and following on from the theme of this months box of Back To School, I gave one to Phil to take for his lunch. We both love them! These ones have a chocolate biscuit with a piece of white chocolate in the middle, if you love chocolate then this ones for you! It particularly is good for that chocolate fix, as there is so much chocolate there, you only really need the small bar to satisfy that craving and not feel too guilty about it! 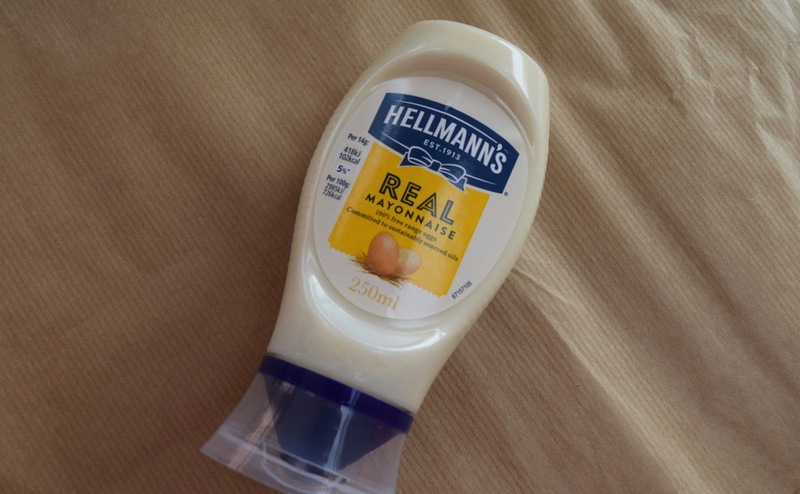 I will be completely honest, I am not a lover of Mayonnaise, there I said it. However, I know that it is great to use for lunches and meals to add some flavour. It would be perfect for sandwiches or salads, I'm thinking egg mayo or tuna mayo here! Or to use at BBQ's, if we have any last minute hot weather, or for dinners now the kids are back to school! I'm a kid at heart, and I must say I got a little bit excited by the JellySqueeze in the box! There are Orange and Apple & Blackcurrant flavours, I automatically went for Apple & Blackcurrant and Phil wanted the Orange, oh how things work out so well! It's actually quite a big pouch but it would be the perfect snack for on the go or for a school packed lunch. The bonus is that it is lactose and gluten free and also suitable for Vegans and Vegetarians. When I tried to go Vegan for January in 2016, I found it so hard to find products for Vegans, so this is amazing that it is suitable for them too! I was so excited to find these in Degustabox this month! I've tried some flavours before, as Superdrug is right by where I work and it's a healthy snack under 100 calories! The pesto and sundried tomato is quite a strong flavour, but tasted delicious, reminded me of pesto pasta but in a crisp form! And the sweet and smoky chipotle was just as delicious too. These crisps are popped chips but not actually using potato which is amazing! They are in fact made from soya and chickpea which makes them gluten free, suitable for Vegetarians and free from artificial flavours. There were also a number of other very exciting products I cannot wait to get using. I must say I was very intrigued by this bottle when I pulled it out! Twisted Halo contains only natural flavours, and does not have any added sugar or sweeteners. An alcoholic drink for only 90 calories, I know, I must be joking, but I'm really not! It is not necessarily flavours I would put together, with the coconut water and the after taste and ginger and lime, I can't say it was right up my street and I'm not sure I would buy it again. 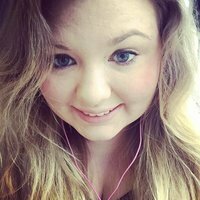 I think it's one of those products that I would need to try a few times to get used to it! 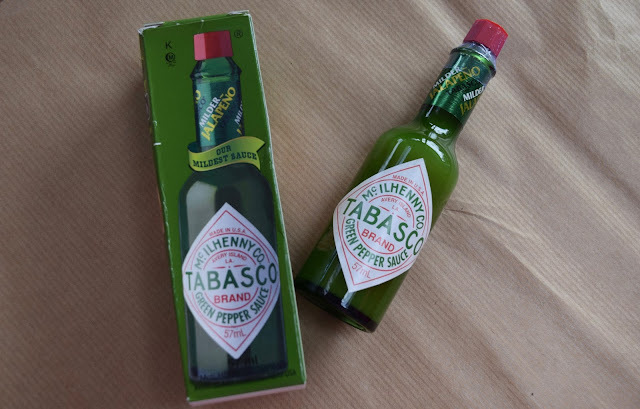 I will be completely honest again, I've never used Tabasco in anything, but when I found this in the box this month, I was intrigued and suddenly started thinking of all kinds of recipes that I could make with it! The Green Pepper Tabasco Sauce has the same incredible flavour of the original one but instead has a milder flavour which is what got me thinking! I do enjoy spicy food but sometimes there is just too much. My plan is to use it in a marinade for some salmon and made a dish out of that and also to use it in dressings for salads, and perhaps pop a little bit in with stir fry to give it a kick and some much needed flavour. I received two flavours of the Noodles in Degustabox: Sticky Hoisin Duck Noodles and Fiery Sweet Chilli Noodles. I tried the Maggi Fusian Noodles when they first came out, and I didn't quite enjoy the flavour I had chosen but I love Hoisin Duck so I am definitely going to be giving it a go! Verdict to come! 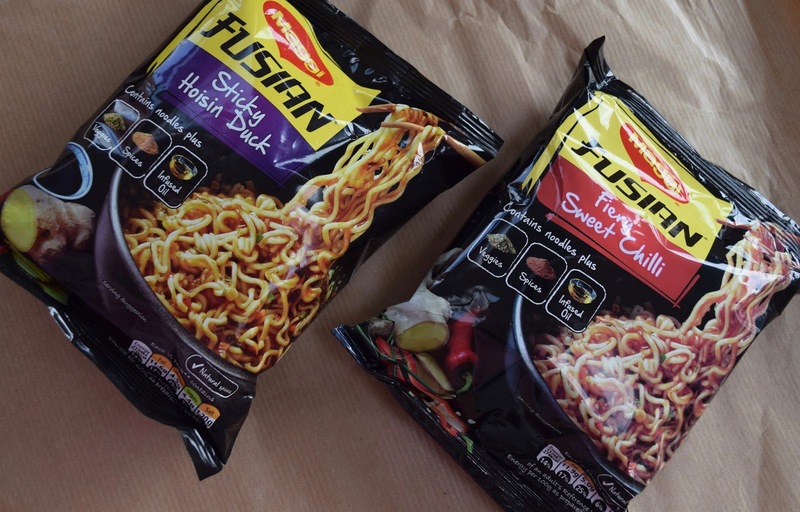 It's also pretty amazing that you can get noodles packed with flavour in only 4 minutes. How good is that for an easy dinner?! Eek, look at these bottles! This was by far amazing! It's like his and hers, and what's even better is that the light version was the one wearing a bikini. Yes, I got extremely excited over the novelty of these bottles, but really who wouldn't?! Orangina is delicious anyway so I had no doubt that I would enjoy it, I've only ever tried the original flavour and this time only had the light, but I honestly think there is no difference and it was so delicious. It would also be perfect for a mocktail or cocktail! I love Refreshers, they are great, you literally cannot knock them so I was a little intrigued when the Refreshers Softies were in my box. I didn't enjoy them as much as I thought I would, I thought they were too foamy and soft, and they had the same fizz as the normal ones which I did enjoy, I think it was the texture more than anything, and I would have preferred them to be smaller. I think I will personally stick to the original ones! I have seen a lot of the Cadbury Big Taste chocolate bars around but never tried them, I don't like toffee or caramel chocolate bars (please don't judge, it just gets too sweet), but I do like bars like fruit and nut or just the nut ones. So of course I gave it a go. Only a couple of squares mind, too many syns otherwise! I enjoyed it, not enough to finish it but it was taste. There wasn't as much toffee as I was expecting as there was a whole nut in each chunk, so that was a bonus for me, but if you like nutty chocolate and caramel chocolate, you are on to a winner with this one! Lastly, everyone went a bit nuts over this and my sister even offered to pay me for the bag of these, instead I shared them with Phil and split them between our lunches (I won massive girlfriend points for this). 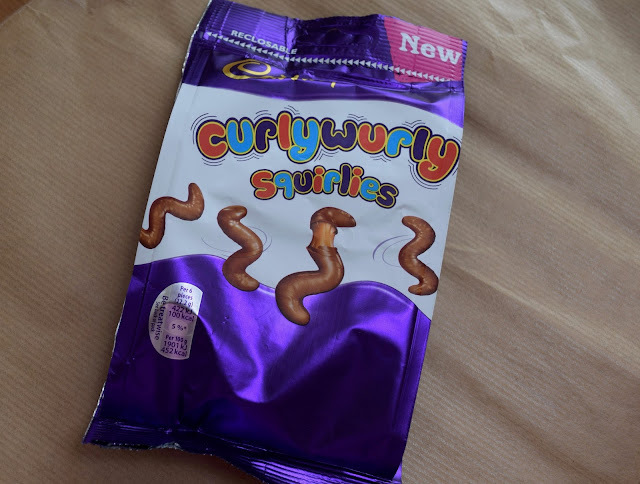 These are a variation of Curlywurly's, obviously, but only little bits, like bite sized pieces! I'm sure you have had that problem where the Curlywurly gets stuck in your teeth and you have that long bit of caramel that never goes and the proportion of chocolate to caramel then goes all wrong, yeah that. SO this solves all your problems! You can have that Curlywurly and eat it. 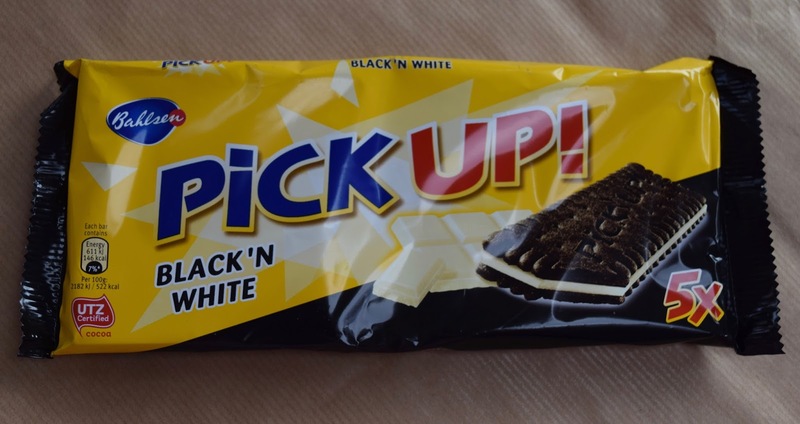 BRB going to find myself another bag of these. And that is everything in the box, I simply could not pick a favourite as I have tried so many new products as part of this box, some that I would definitely go out and buy again too! Which would you like to try the most? You can use the code PU9SR, to get your first box for only £5.99, I can assure you it is worth it!